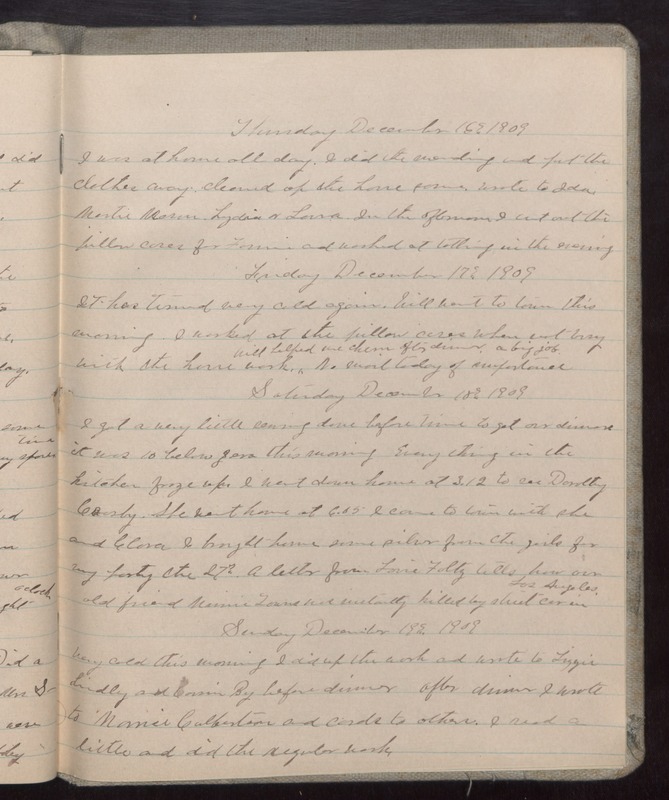 Thursday December 16th 1909 I was at home all day. I did the mending and put the clothes away cleaned up the house some. wrote to Ida. Martie Mason. Lydia & Laura. In the afternoon I cut out the pillow cases for Fannie and worked at tatting in the evening Friday December 17th 1909 It has turned very cold again. Will went to town this morning. I worked at the pillow cases when not busy with the house work Will helped me churn after dinner a big job. No mail today of importance. Saturday December 18th 1909 I got a very little sewing done before time to get our dinners it was 10 below zero this morning Every thing in the kitchen froze up. I went down home at 3.12 to see Dorothy [Crosby? ]/ She went home at 6.05 I came to town with she and Clara I brought home some silver from the girls for my party the 27th. A letter from Louie Foltz tells how our old friend [Marnie Towns?] was mortally killed by street car in Los Angeles. Sunday December 19th 1909 very cold this morning I did up the work and wrote to Lizzie Lindley and Cousin By before dinner after dinner I wrote to Marnie Culbertson and cads to others. I read a little and did the regular work.